Children with Down syndrome who had followed a memory training program were reassessed three years later. The program, which involved training rehearsal and organisation strategies to improve short term memory, had resulted in significant gains on tests of auditory and visual memory skills. These gains were maintained for at least eight months after the end of the training period. However, after three years, memory capacity was found to have declined, although word spans were still significantly greater than those found before the training program began. By comparing the performance of the children in the follow-up study with an untrained group matched for age, vocabulary and grammar understanding, it was concluded that this increase could be attributed to developmental progress and not to any residual effects of training. None of the children had continued to practice the memory training routines resulting in the loss of the trained memory skills over time. One feature of the cognitive functioning of children and adults with Down syndrome is their poor short-term memory (Bower and Hayes, 1994; Hulme and Mackenzie, 1992; Mackenzie and Hulme, 1987; Marcell and Armstrong, 1982; Marcell and Weeks, 1988). This deficit is revealed by a severe restriction in the development of memory capacity as measured by digit span or word span. Whereas the number of digits normally developing children can remember in sequence increases from about 3 digits at the age of three to 7 or 8 digits at the age of sixteen (Chi, 1977), the most digits people with Down syndrome will remember is usually 3 or 4 (Hulme and Mackenzie, 1992). The number of unrelated words remembered in sequence is similarly restricted (Hulme and Mackenzie, 1992). The implications of this problem may extend beyond difficulties with remembering sequences of numbers or lists of words. The processing of verbal information in short-term memory, or phonological memory, is central to a wide range of other cognitive and language functions. Gathercole and Baddeley (1993) have drawn together research evidence indicating a role for phonological memory in vocabulary acquisition, in language comprehension, and in learning to read. Also, Fowler (1995) suggests that poor phonological memory could account for the deficits in morpho-syntactic development found in those with Down syndrome. Understanding the way in which memory processes in this population influence other areas of their cognitive development, and the effects of any remediation programs, are thus important current research goals. This paper reports the results of a study to follow up children who had received memory training some three years previously. Their memory performance was re-assessed, as well as current performance on standardised language measures. Before going on to describe the study, the theoretical background to the research and the program's essential features are briefly described (readers requiring more details are referred to Broadley, 1994; Broadley and MacDonald, 1993; Broadley, MacDonald and Buckley, 1994; Broadley, MacDonald and Buckley, 1995). The most influential theoretical account of storage and recall of verbal information from short-term memory, the `working memory' model (Baddeley, 1986; Baddeley and Hitch, 1974), not only accounts for the developmental increase in memory capacity and other memory phenomena revealed by experimentation, but also suggests a strategy for remediation. The `working memory' model consists of three components. A central executive operates as a control system, regulating the flow of information within working memory and co-ordinating activity with other cognitive systems. Two so-called `slave' systems each deal with different types of material: the visuo-spatial sketchpad handles the processing of spatial and visual information; and the phonological loop is specialised for the storage of verbal material. The phonological loop is fractionated into a short-term store and a subvocal rehearsal or articulatory loop where items placed in the store for remembering are rehearsed. Without rehearsal these items (for example, lists of words or digits) would fade. The articulatory loop is also used when recoding visual material, such as pictures, into a verbal code. Experimental evidence for the articulatory loop includes the fact that fewer long words can be remembered than short words - long words take longer to rehearse and so fewer of them can fit within the limited capacity of the loop (Baddeley, Thomson and Buchanan, 1975). Developmental increases in memory span can be accounted for by the fact that children develop faster speech rates with age allowing them to rehearse more rapidly and thus recall more as they become able to hold more items in the rehearsal loop (Hulme and Tordoff, 1989). Also, children may become more efficient users of rehearsal for remembering verbal material as they become more aware of the need to use such a strategy. Since rehearsal has such an important role both in remembering verbal information and in recoding pictorial information, any lack of rehearsal could place serious limits on the development of memory capacity, and could, at least in part, explain the deficits found in people with learning disabilities (Bauer, 1977). Several studies have achieved improvements in memory capacity by training a rehearsal strategy, resulting in increased performance for normally developing children (Flavell, 1970) and for children with learning difficulties (e.g. Bowler, 1991; Broadley, 1994; Comblain, 1994; Hulme and Mackenzie, 1992). Broadley's (1994) memory training program aimed to teach rehearsal to children with Down syndrome, and also included the teaching of organisation and clustering of items as a recall strategy, based on earlier work by Herriott and Cox (1971). A group of 25 children took part in the program in which rehearsal and organisation were taught in two consecutive blocks lasting six weeks each. Some of the children were trained by Broadley, and some of them were trained by keyworkers who were briefed on the training methods. The performance of the trained children was compared with that of a control group, matched on age and ability. Post-training measures showed both types of training were effective in increasing memory capacity. In brief, the children showed significant improvements on standardised test measures, and increases in word span for auditory and visual presentation of items and for a probe condition. The greatest gains were made for visually presented stimuli. The children also showed improvements on measures reflecting the trained organisation skills. These included a category naming task, an oddity task where the child had to choose the "odd one out", and a fluency measure. Having established that these memory skills could be trained, the next questions of interest were whether the skills could be maintained over time and whether the children would generalise their use to tasks other than those on which they had received specific training. To answer these questions the children were re-assessed two months, and then eight months after the first post-training assessments (Broadley, MacDonald and Buckley, 1994). The trained group maintained performance on memory tests, although the difference between the trained and control groups was reduced by the fact that the control children had also made some improvement over the same period. Similar results were found for the organisation measures; the trained group maintained their higher scores while the absolute difference in means decreased due to some gains being made by the control group. Word span measures for one-, two-, and three-syllable words remained significantly greater for the trained children than for the control children under all conditions, but the difference was more marked for conditions involving visual presentation of stimuli. The trained children also did significantly better than the control group on a series of tests designed to assess whether they could generalise the use of the trained skills to other tasks (Broadley, 1994). One further important outcome of the study was that some significant differences in maintenance scores were found between the children who were trained by a keyworker and those who were trained by the experimenter. Since the keyworker, whether a parent or teacher, would have had the opportunity to continue the training, or to remind the child to use the trained skills in other contexts, this was unsurprising. It could also explain the generally successful maintenance of trained skills in Broadley's study compared with other studies. For example, Comblain's (1994) subjects' memory performance six months after training fell to levels significantly below their immediate post-training levels, although it was still better than before training began. Her procedure involved contact with the experimenter for just half an hour per week over eight weeks. 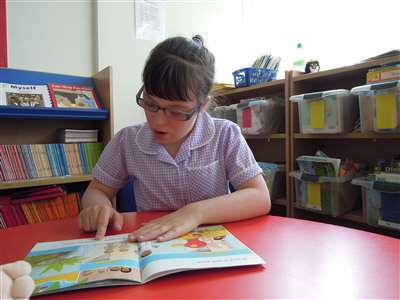 Although there had been no arrangement for Broadley's participants to continue using the memory training procedures, it seemed possible that taking part in the study would have increased parents' and teachers' awareness of the importance of short term memory, and that the improvements made by the children would have encouraged continued use of the activities. The purpose of the study reported here was to investigate maintenance of the trained skills in the longer term. The main questions of interest were whether memory performance continued to be maintained and further, having apparently started to use a rehearsal strategy, would the children continue to make gains in this area and show something more like a normal developmental increase in memory span. With these questions in mind the children were re-assessed three years after the original post-training assessments using a subset of those measures. Full details of the methods used to train the children are reported elsewhere (Broadley, 1994; Broadley and MacDonald, 1993), as are details of the earlier follow-up study which investigated maintenance of the trained skills 8 months after the training program was completed (Broadley, MacDonald and Buckley, 1994). A detailed analysis of the original memory measures has also been reported earlier (Broadley, MacDonald and Buckley, 1995). The original study included children from two geographical regions but it was not feasible to follow-up children from the more distant region. Parents of all the children for whom addresses were available were contacted for permission to re-assess their children, and were asked to complete a short questionnaire so that any child who had had a serious illness since the last assessment, or other problems which might affect their performance, could be excluded from the follow-up study. The questionnaire also asked whether the children had continued with memory training and whether this had been done at home or at school. The final sample included 14 children (3 males and 11 females) and ranged in age from 8 years 8 months to 14 years 10 months (mean=10 years 10 months). Six of the children were visited at mainstream schools and the remainder were visited at two special schools, although one of these children had been in mainstream school during the training period. - short form (BPVS) (Dunn and Dunn, 1982) - a measure of receptive vocabulary. - a test to measure the children's levels of grammar understanding. - a non-verbal test of general cognitive ability. - These consisted of a Category Naming task where the child was shown a set of pictures and asked to name each object. The child was then asked to provide the superordinate name for the objects (e.g. animals, fruit etc.). One point was given for each category correctly named (max=8). A Category Oddity task required the child to select one object from a group of four that did not belong to the set. One point was scored for each correct choice made (max=8). The Fluency test from the McCarthy scales (McCarthy, 1972) was also used; in this test the child is required to list all the items they can think of from four categories supplied by the experimenter (max=36). - These included word span measures under two conditions of presentation. In the auditory condition the experimenter spoke the words and the child was asked to repeat them. In the visual condition the experimenter presented picture cards of the objects and said the word as each card was laid down in sequence. The cards were then turned over and the child was asked to repeat the sequence of names. Performance was measured separately for words of one-, two- and three-syllables. Word span scores were recorded as the longest sequence that the child could recall under each condition. - These were three tests devised to assess whether the children were generalising the trained skills to other tasks. In the Faces test, the child was shown four photographs of faces and given a name for each face; the faces were then re-presented and the number correctly named recorded (max=4). The child was also given a complicated instruction that required him or her to remember a list of items to be retrieved from a box on the other side of the room (max=6). A picture memory test was also used (max=6). Assessments were conducted on visits to the schools in June and July 1995 and scores were compared with those for the children in this sample collected on three earlier occasions: October 1991 - the baseline scores prior to training; July 1992 - post-test measures immediately after training; March 1993 - post-test measures eight months after training. Table 1 shows the ages of the children and their mean language and matrices scores pre-training and also gives this information for the whole trained group at the beginning of the study for comparison. Table 1: Mean ages in months, Matrices and language scores for follow-up group compared with original sample (s.d. 's in brackets). The sample selected for follow-up does not reflect the full range of the original sample. The mean scores, pre-training, for the follow-up sample were generally below the average for the whole trained group because few of them came from the older end of the original age-range. Twelve children completed word span tasks under every condition at each assessment point. Table 2 shows the mean values recorded for auditory and visual word span for one-, two- and three-syllable words at each of the four assessment points. Table 2: Mean number of items recalled under two presentation conditions and for three syllable lengths at four assessment points (s.d. 's in brackets). A three way repeated measures analysis of variance (ANOVA) was used to investigate the effects of Time (4), Mode of Presentation (2) and Word Length (3). This showed a significant effect for Time (F=28.02; df=3,33; p<0.0009). Means across all memory measures taken at each point in time increased from 1.49 items in October 1991 to 2.86 after training in July 1992, to 2.92 items by March 1993 and then dropped to 2.18 items at the most recent assessment. Further analysis investigated the significance of differences between means for each comparison of interest using Dunn's critical values for t (Dunn, 1961). This confirmed that there were significant differences between the pre-training and post-training scores in July 1992 (p<0.01) and again in March 1993 (p<0.01). The follow-up mean in July 1995 was significantly lower than the March 1993 mean (p<0.05). However, despite this drop in performance, there is still a significant difference between means for pre-training and follow-up measures (p<0.05). A significant main effect was also found for Mode of Presentation (F=47.12; df=1,11; p<0.0009). More items were remembered for visually presented stimuli than for auditorily presented stimuli. Means across time of measurement and the three syllable lengths were 2.04 items for auditory presentation compared with 2.69 for visual presentation. The analysis also shows a significant interaction effect between Time and Mode of presentation (F=10.44; df=3,33; p<0.0009). Mean memory scores for visually presented items were much greater after training than those for auditory memory scores, but at the start of the study there was little difference between auditory and visual memory scores. By the time of the follow-up study, most of the advantage for visually presented items has been lost and, once again, there is only a very small difference between auditory memory and visual memory. Word Length also produced a significant effect (F=27.83; df=2,22; p<0.0009). Table 2 shows that at all assessment points, and for both modes of presentation, the number of items remembered consistently reduces with the increase in the number of syllables in the test words. There were no interactions between Word Length and Time or Word Length and Mode of presentation, and no three-way interaction. Although the results show a significant difference between the latest word span scores and pre-training word spans, this could be due to a developmental increase in span rather than to maintained effects of the training. Measures for children from the control group would have been useful for comparison. However, in the absence of these, it was possible to compare the final maintenance data with those obtained from different children in the original study tested before training. The children who took part in the follow-up assessments were matched with children from October 1991, i.e. before training. As well as matching for age, the children were also matched as closely as possible for gender, and for BPVS and TROG scores. If the difference between pre-training and follow-up memory scores can be attributed to developmental increases only, then there should be no difference between the trained and matched children. If there is a significant difference, then this could be attributed to the residual effect of the training. Table 3 shows the mean ages and language scores for the trained and matched untrained children. There were no significant differences in age or language ability for these two groups. Table 3: Mean ages, language and memory scores for follow-up group and matched children (s.d. 's in brackets). An auditory memory and a visual memory score were calculated as the average word span across the three syllable lengths for each modality. Mean memory scores for the two groups are shown in Table 3. Independent groups t-tests showed no difference between the groups for auditory memory but a small but significant difference between the visual memory measures for the groups (p=0.04); the mean visual memory span for the trained group is 0.5 items longer than that for the matched children. On the face of it, this could be interpreted as evidence for long term maintenance of the visual memory skills. However, examination of assessment records for individual children suggested there may be a link between memory performance and whether or nor they have reading skills, demonstrated by achieving a score on the BAS reading test. (A paper describing these links, and the effects of reading on language skills, has been published (Laws, Buckley, Bird, MacDonald and Broadley, 1995). Although the difference in means observed could be due to the training, it could also be due the fact that there were only four readers in the matched group whereas half the trained group were readers (since it had not been possible to match the children for reading ability as well as for the other measures used). Two-way ANOVAs were used to investigate the effects of training (trained group versus matched group) and reading (readers versus non-readers) on auditory and visual memory scores. Age was included in these analyses as a covariate. The analysis of auditory memory scores confirmed there was no significant difference between the means for trained and matched children (2.05 versus 1.94), but there was a highly significant difference in means between readers and non-readers (2.59 versus 1.64) (F=20.36; df=1,19; p<0.0009). The comparable analysis for visual memory produced similar results. No significant part of the variance in scores was attributed to training (2.31 versus 1.81), but there was a significant difference in visual memory scores between readers and non-readers (2.56 versus 1.76) (F=13.81; df=1,19; p=0.001). Thus the larger mean visual memory score observed for the follow-up group may be due to the fact that there were more readers in this group than in the group of matched children. Further analyses of the differences between readers and non-readers on the follow-up measures are reported by Laws et al (1995). Eleven children completed all the organisation measures - category naming; choosing the odd one out; and the McCarthy Fluency test. Table 4 shows the mean scores at each of the four assessment points for each of the measures. Table 4: Mean scores for category naming, category oddity and fluency tasks at four assessment points (s.d. 's in brackets). Repeated measures ANOVAs were used to investigate the differences between means over time for each of the three meaures. Significant differences were found for all three variables (Category naming: F=20.47, df=3,30, p<0.0009; Category oddity: F=17.00, df=3,30, p<0.0009; Fluency: F=9.55, df=3,30, p<0.0009). For each measure, tests of significance were made for each comparison of interest using Dunn's critical value for t. For all three measures, these confirmed a significant difference between pre-training mean scores and post-training means in July 1992 (p<0.01) and maintenance scores in March 1993 (p<0.01). For two of the measures, mean scores were still significantly higher at follow-up than pre-training: category oddity (p<0.01) and fluency (p<0.05). However, category naming scores had declined by follow-up from their post-training levels, as evidenced by a significant difference between the mean for March 1993 and follow-up in 1995 (p<0.05) and by the fact that there was no significant difference between pre-training and follow-up scores. The July 1995 scores were compared with those obtained in October 1991 from the same matched children described in the analysis of the word span tasks. Table 5 shows the mean scores obtained for each of the organisation measures by children in the follow-up study and by the matched children in October 1991. Independent groups t-tests showed no significant differences between the mean scores obtained by trained and untrained children. Table 6 shows the scores achieved by the follow-up children on the three tests used to investigate whether rehearsal skills were used to remember items in other contexts. Table 6: Mean scores on tasks used to assess generalisation of rehearsal skill in March 1993 and at time of follow-up assessment. T-tests showed that there was no significant decrease in ability to remember the names for four faces or in the ability to remember a complex instruction. There was, however, a significant decrease in the number of pictures recalled in the picture memory task. Since these tasks were only introduced post-training, it is not possible to compare this performance with that of untrained children. Our analyses show quite similar patterns over time for the effects of rehearsal training and organisation training. Word spans increased sharply and significantly after the training in 1992 and these gains were maintained for at least eight months. However, three years later performance on the memory tasks has fallen to the same level as that achieved by children with similar ages and language abilities who had not been trained. Although the trained children appeared to have an advantage over the untrained children in terms of visual memory skills, further analysis established that better visual memory could be attributed to children who were readers but not to the training program. Similarly, reading, but not taking part in the training program, resulted in better auditory short-term memory. This finding was of great interest, and supports the view of Buckley (1995) that reading should lead to an improvement in short term memory. The relationships among literacy, language development and memory are complex, and the literature from the study of typically developing children suggests reciprocal interactions among them (Ellis and Large, 1988; Gathercole and Baddeley, 1993). Further data from the follow-up study relating to these relationships, and further discussion of the influence of reading instruction on language development and memory in children with Down syndrome are reported elsewhere (Laws et al, 1995). The differences between the effects of the training on visual memory compared with auditory memory are worth some comment. Immediately after training, visual memory performance was significantly greater than auditory memory performance. Three years later, there is no longer a difference between mean visual and mean auditory memory scores. The earlier advantage could have been due to the nature of the training which concentrated on routines to remember sequences of pictures. Thus the assessment of visual memory provided test conditions more closely related to the training routines than tests of auditory memory which were unsupported by picture material. However, many earlier studies indicate a strength in visual processing compared to auditory processing in people with Down syndrome (Pueschel, 1988). Since verbal responses to both visual and auditory presentation of stimuli were required in the tests reported here, it seems that the advantage provided by visual material may be in terms of the input of information. This is important to know in relation to teaching practice, and is a factor that has been stressed in advice to parents and teachers of children with Down syndrome (Bird and Buckley, 1994). Scores obtained for the three organisation measures (category naming, category oddity and fluency) also declined from levels obtained immediately after training. Although two of these measures still showed a significant increase over pre-training scores, comparison with the matched, untrained group shows that this increase is also developmental rather than the continued effect of training. Although it is disappointing to find that the children have not maintained the levels of memory performance achieved after the training, still less to build on this progress, it is scarcely surprising. Despite the ability to achieve improved word spans, it seems the children did not continue to use an effective rehearsal strategy spontaneously once training ceased. The information received from the few parents who responded to the questionnaire suggests rehearsal practice had not continued. As a consequence of this fall off in practice, and in memory performance, it has not been possible to investigate the impact that sustained improvements in memory might have on other aspects of language development over time. Given the evidence from research on children in general for the importance of working memory to acquiring, processing and understanding written and spoken language, this remains an important goal of current research on memory and language development in children with Down syndrome. The authors would like to thank the parents, teachers, and children who took part in this study. The collection of data from the early part of the study was funded by a bursary from the Portsmouth Down Syndrome Trust to Irene Broadley. The follow up study was funded by a grant from the University of Portsmouth. Baddeley, A.D. (1986). Working Memory. Oxford: Oxford University Press. Baddeley, A.D., and Hitch, G. (1974). Working memory. In G. Bower (Ed.) The Psychology of Learning and Motivation, (Vol. 8, pp.47-90). New York: Academic Press. Baddeley, A.D., Thomson, N. and Buchanan, M. (1975). Word length and the structure of short-term memory. Journal of Verbal Learning and Behaviour, 14, 575-589. Bauer, R. (1977). Memory processes in children with learning disabilities: evidence for deficient rehearsal. Journal of Experimental Child Psychology,24, 415-430. Bishop, D.V.M. (1983). Test for the Reception of Grammar (TROG). Department of Psychology, University of Manchester: Chapel Press. Bowler, D. (1991). Rehearsal training and short-term free recall of sign and word labels by severely handicapped children. Journal of Mental Deficiency Research, 35, 113-124. Broadley, I. (1994). Teaching Short-term Memory Skills to Children with Down Syndrome (Unpublished PhD thesis) Portsmouth, U.K.: University of Portsmouth. Buckley, S. (1995). Reading and writing in Down syndrome. EDSA Third International Down Syndrome Symposium, Mallorca, Spain. In J.A. Rondal, L. Nadel and J. Perrera (Eds) Down Syndrome: Psychological, psycho-biological and socioeducational perspectives. London: Whurr. Chi, M. (1977). Age differences in memory span. Journal of Experimental Child Psychology, 23, 226-281. Dunn, L.M. and Dunn, L.M.L. (1982). British Picture Vocabulary Scale (short form). Windsor: NFER-Nelson Publishing Company. Dunn, O.J. (1961). Multiple comparisons among means. Journal of the American Statistical Association, 56, 52-64. Elliott, C.D., Murray, D.J. and Pearson, L.S. (1978) British Ability Scales. Windsor: NFER Publishing Company Ltd.
Ellis, N., and Large, B. (1988). The early stages of reading: a longitudinal study. Applied Cognitive Psychology, 2, 47-76. Flavell, J.H. (1970). Developmental studies of mediated memory. In H.W. Reese and L.P. Lipsitt (Eds.) Advances in Child Development and Behaviour, Vol. 5. New York: Academic Press. Fowler, A.E. (1995). Linguistic variability in persons with Down syndrome: research and implications in L. Nadel & D. Rosenthal (Eds.) Down Syndrome: Living and Learning in the Community. New York: Wiley-Liss, Inc.
Gathercole, S.E. and Baddeley, A.D. (1993). Working Memory and Language. Hove: Lawrence Erlbaum Associates Ltd.
Herriot, P. and Cox, A.M. (1971). Subjective organisation and clustering in the free-recall of intellectually subnormal children. American Journal of Mental Deficiency, 75, 702-711. Hulme, C. and Mackenzie, S. (1992). Working Memory and Severe Learning Difficulties. Hove: Lawrence Erlbaum Associates Ltd.
Hulme, C. and Tordoff, V. (1989). Working memory development: the effects of speech rate, word length, and acoustic similarity on serial recall. Journal of Experimental Child Psychology, 47, 72-87. McCarthy, D. (1972). McCarthy Scales of Children's Abilities. New York: The Psychological Corporation. Mackenzie, S. and Hulme, C. (1987). Memory span development in Down syndrome, severely subnormal and normal subjects. Cognitive Neuropsychology, 4, 303-319. Marcell, M.M. and Armstrong, V. (1982). Auditory and visual sequential memory of Down syndrome and non-retarded children. American Journal of Mental Deficiency, 87, 86-95. Marcell, M.M. and Weeks, S.L. (1988). Short-term memory difficulties and Down syndrome. Journal of Metal Deficiency Research, 32, 153-162. Pueschel, S.M. (1988). Visual and auditory processing in children with Down syndrome. In L. Nadel (Ed.) The Psychobiology of Down Syndrome. Cambridge, MA: MIT Press. Raven, J.C. (1963). Coloured Progressive Matrices. London: H.K. Lewis & Co. Ltd.